I have a log on my desk. It is a nice log. I carry a lot of building supplies around with me these days. Just yesterday I was feeling really burdened and then realized I had a 50 ft metal tape measure, a piece of travertine marble, two construction pencils, an eraser and a lipstick in my pocketbook. Under the circumstances I suppose I should be grateful not to have found the log in there too. In reality, given the way the house is moving, It seems normal to have a big log on my desk. It won’t fit into my pocketbook but I can carry it. I am all about carrying a log around with you. Toting a log can be burdensome in many ways. First, the bloody things are heavy. Second, it is hard to maneuver in crowds. I find it particularly hard getting on an escalator. Every time I think I’ve got it and I turn to make sure all is right, I whack something. Thankfully most escalators are by walls so I whack the walls not a person. The other reason it is hard to carry a log around with you is because when you don’t know where to put it it makes your spirit tired. When we were kids we used to tease about the Bible story where Jesus said that if you made a big deal about a mote in someone else eye had better look for the beam in your own. When you are 8 years old that is about the funniest image you could imagine. Being kids, we had to make it one more bit funny and turned the beam into a log. After a while I leaned about having a chip on your shoulder. I thought my log image was a lot better than a chip. I actually never have figured out what a chip was other than something left over from a previous building project. I suspected that some of the people I heard had chips on their shoulders were not building new houses. Which brings me full circle to why I have a log on my desk. We have been trying to sort out the best outside for our house. We originally thought of plain siding but that was a pretty bad idea in an area where there were fires. As I wrote previously I really did not want cement board no matter how natural they can me it look now. It is not “real” and I just did not want it on my house. So, we have logs. We have lots of logs. 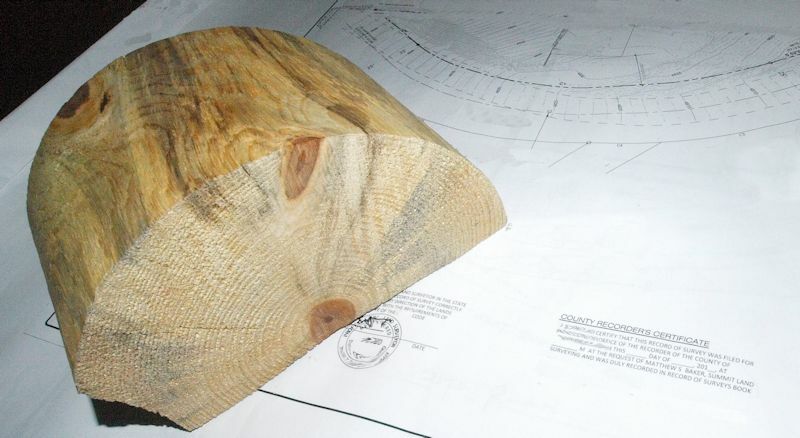 We have bids from several log companies and we have ideas from all of our friends and family and some from our neighbors. I still have a log on my desk. I have always worried that if I built a house with all the chips flying around one would land on my shoulder. I worried I might not notice there was a chip on my shoulder. We are going to start building soon and I am almost certain if I let the chips fall where they may one is one is going to land on my shoulder and I won’t even know it. I think I shall just keep my log. At least I can tell when it is there.